Creation: Appeared February 15, 2012 (CTB) as an upgrade to SR 7100. Ran as it does today. 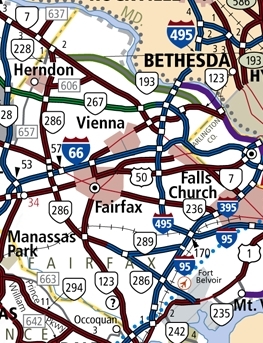 There is a gap between I-95 and VA 289. This is the 2nd VA 286. VA 286 has a number interchanges along its path but is not really controlled access or a true freeway for any real length. Posting: VA 286 postings appeared in June 2012. VA 286 is prominently posted on the gap. Legislative names: John F (Jack) Herrity Parkway, entire route (3-14-95 designation predates VA 286 designation). Comments: The Fairfax County Parkway was constructed over a 20+ year period, starting with the piece between I-66 and US 50 which was in place by 1988. The 1989 Official Map was the first to show the route in its entirety, as dotted lines minus the short opened section. By 2000, only the gap between I-95 and SR 7900 (now VA 289) remained, which was opened in September 2010. 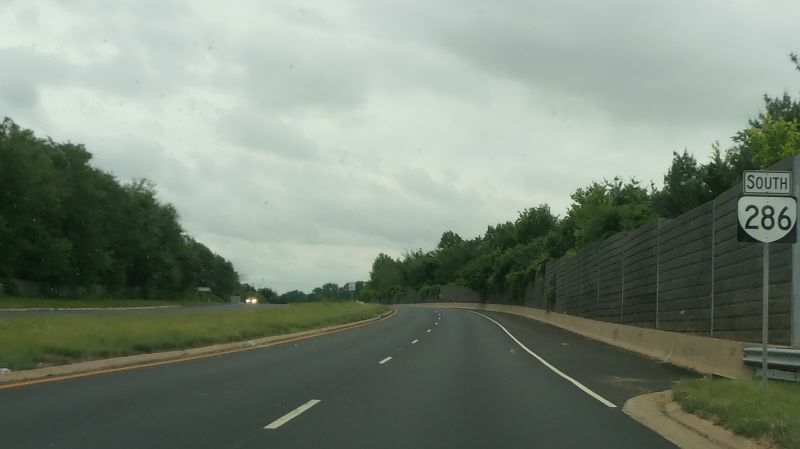 The Fairfax County Parkway is a bit harrowing to drive - the speed limit is mostly 50, with interchanges inviting higher speeds while traffic lights still exist in many locations. The road has a fair amount of accidents. 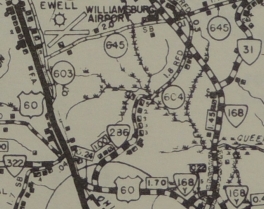 VA 286 #1: Appeared Aug 1933 (CTB) as a spur north from US 60 west of Williamsburg. VA 286 never connected to the new VA 168 (curr VA 30) and was downgraded to SR 604 in Sept. 1942 (CTB Minutes). Was there a VA 286 between July 1933 and Aug 1933? There is a confirmed VA 287 that existed in this timeframe, which suggests there should have been a VA 285 and a VA 286 that were short lived and likely on paper only. 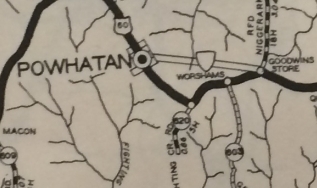 One potential location was what turned out to be the US 60 bypass of Powhatan CH, which is shown on the 1933 Powhatan County map with a blank VA route shield. Could this have been temporarily designated as VA 285 or VA 286? Mystery route on Powhatan Bypass. Was this VA 286?